Image courtesy of Security cameras show the the thief walking into the restaurant just as the customer realizes he is short $2,200. Security cameras show the the thief walking into the restaurant just as the customer realizes he is short $2,200. Last week, we told you about the unlucky El Pollo Loco customer who accidentally dropped $2,200 in the parking lot, only to have it stolen by another customer who then sat and ate his meal while his victim undertook a frantic search for the cash. Now we hear there is some good news, as the eatery plans to gift the money back to him. Reps for the chain tell Consumerist there will be an announcement later today at the El Pollo Loco in Manteca, CA, where the incident occurred. Both the customer and the franchise owner are supposed to be on hand when the restaurant provides him with the money he lost on that April evening. For those coming late to the story, here’s what happened. The customer had been saving up money in order to move to the area to be closer to family. He pulled into the El Pollo Loco to get some food, but as he exited his truck he accidentally dropped the wad of cash on the ground next to his truck. The drop was spotted by a man in a nearby car who jumped into action the moment the customer went inside the building, swooping in to pick the money up off the ground. 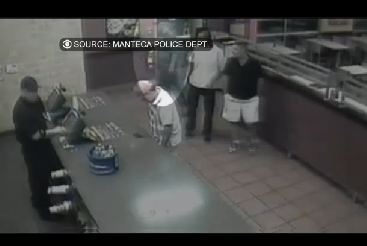 But rather than flee the scene like a decent criminal — or return the money to the first man like a decent human being — this second man went inside the El Pollo Loco and ordered some food for himself, which he then ate while the other man began to panic. In spite of a $1,300 reward being offered for the return of the money — and security footage of the incident being posted online — it appears that the thief has not been apprehended.